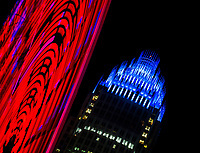 Photography of the Eye on Tryon, an 80-foot ferris wheel in Uptown Charlotte, North Carolina. The 10 day ride gives the riders a chance to see Uptown Charlotte from a different view. The ferris wheel is located at 7th and Tryon Street.